With Labor Day weekend coming up, and outdoor parties and barbecues on the horizon, it’s good to have a classic guacamole recipe in your back pocket. Although I don’t have brothers or sisters, I never felt lonely when I was growing up. My mother and father had siblings to spare, and my parents, grandparents, aunts, uncles and cousins gathered often — to celebrate birthdays, holidays, half birthdays, television events. One of the main reasons I wanted to move back to Los Angeles from New York was to give the Nuni (then just a twinkle in her parents’ eye) that family and community that I grew up with. The menu varies — my mother makes mean spare ribs, my aunt often grills sausages. My grandmother’s fallback is barbecued chicken, and the sweet spicy taste of her favored brand of barbecue sauce takes me immediately to childhood summer evenings, shivering in a wet bathing suit while the scent of charcoal smoke fills the air. But whatever the main dish was, we always began with guacamole. If you grow up in California, avocados are in your blood. They’re available at every roadside stand and farmers’ market, and you probably know someone with a tree in their back yard. And as a result, they show up everywhere — in a green salad, on a BLT, or even on a hamburger. 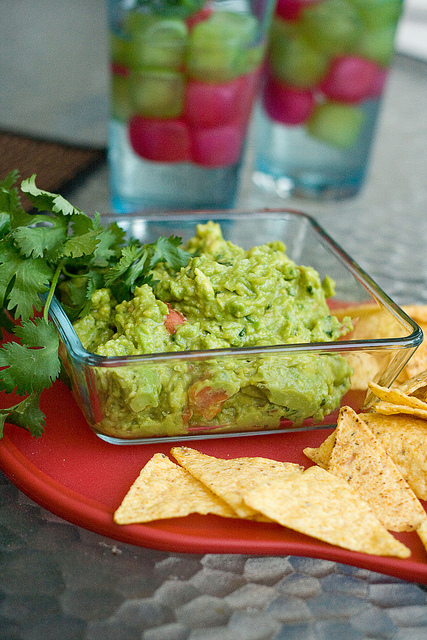 But nothing shows off the nutty flavor and luscious texture of an avocado quite like guacamole. This is my aunt Suzi’s guacamole recipe. It’s easy and quick to make, spicy and salty, with perfect creamy chunks of avocado, tiny bursts of tomato and the scent of cilantro and lime. To me, it’s the ur guacamole — the one all others aspire to. She makes hers in a molcajete, the traditional lava rock pestle, but I’ve found a cuisinart works just as well. With a few tortilla chips and a glass of white wine, nothing says home to me quite like this guacamole. 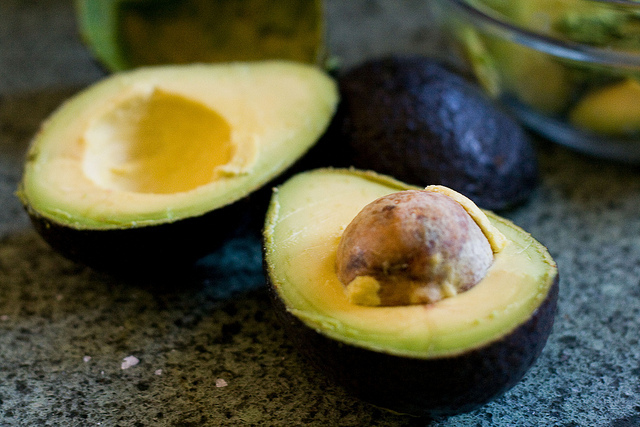 Always use Hass avocados, the kind with nearly black, very bumpy skin. Their flavor and texture is superior. This recipe is quite spicy (depending on the size and heat of your chiles) -- you can reduce the chiles to cut back on the heat, or substitute the serrano for jalapeno. 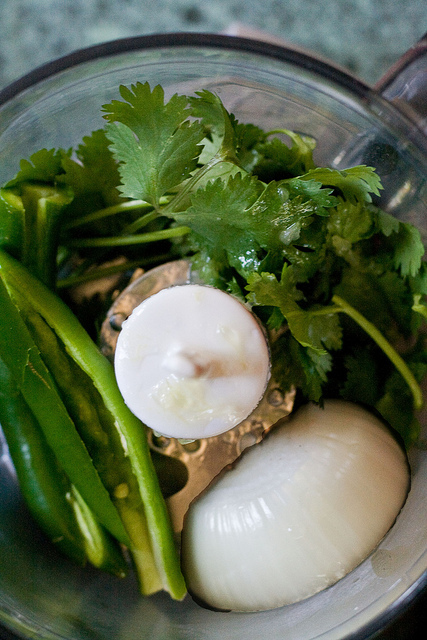 In a small food processor*, combine onion, chiles, cilantro, lime juice and salt, and process until smooth and liquid. (If using a molcajete, chop the onion and chiles first, then grind with cilantro, juice and salt until smooth). Cut the avocados in half. Remove pits (I usually smack them with a chef's knife to bury the edge in the pit, then twist to remove), and scoop the flesh out into a small bowl. Mash with a fork. Don't let the avocados get too smooth - some remaining chunks are good. Mix in the chile cilantro mixture, add chopped tomatoes, and stir until combined. Salt to taste -- I think this guacamole tastes best when it's a little on the salty side. Serve with tortilla chips. *I received a cuisinart mini chopper for free from Cuisinart as an attended of Blogher Food 2009. This is EXACTLY what I do (I use jalapenos because I can find them easily in NYC) except I use a potato masher to get the texture I want. I have two ripe-for-guacamole avocados in my vegetable bowl for afternoon cocktails. It’s still hot as the hinges of hades here, so I imagine it will be margaritas on the front porch – or maybe a tart gin rickey as that became this summer’s cocktail of choice. This is the same way my mom makes it! well, without the food processor.. she usually minces it all up and then mashes it together with a fork. I’d have to cut back on the heat, but otherwise I think we’d love this recipe! What a wonderful post–it makes me hungry for the pleasures of big family get-togethers, but also the luxury of eating guacamole and chips solo on the back patio with that glass of white wine. I like the idea of liquifying the other ingredients before adding them to the avacados–I’ll have to try it soon! So great to meet you too! The recipe looks perfect! Wow! Am I glad I found this recipe (via foodgawker). Easy to make and so, so, SO GOOD! I used jalapenos instead of the serrano chiles, to suit my taste, and, as I said–it was SO good! Awesome. Thanks for the share. I love a good guacamole, and this recipe looks spot on! I just found your blog tonight, and I’m very happy that I did. You are doing some great things here, and I look forward to many more food posts to come! We’ve never met, but we have a few big things in common; I’m extremely passionate about food and am on my way to becoming a lawyer. I also love your mom — she was my “House Mother” when I studied abroad in London, as well as one of my absolute favorite professors/people I met in college. I love your blog, and actually just pulled up this recipe for help with my own (I couldn’t remember how to spell “molcajete” – haha). I just wanted to say hello! I hope you, and your mom, are doing well!